We’re excited to announce that our new Bulk Add Fees and Discounts feature is live! Administrators can now select multiple orders at once to add a fee or discount. This is a commonly requested feature and will be a huge time-saver for Club and Order Administrators. Getting heaps of new registrations is exciting for all youth sports organizations. Manually adjusting a bunch of them with added fees discounts? Not so much. Usually, this falls on the already overworked volunteer Administrator or if you are lucky, you have a financial administrator to help. 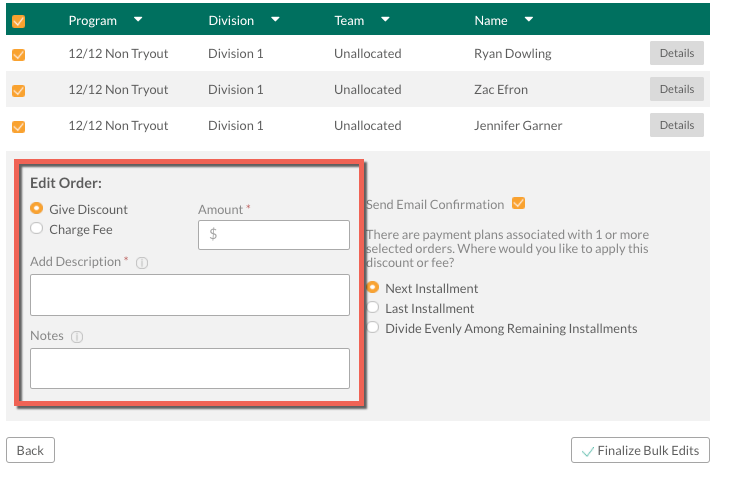 Our new Bulk Add Fees and Discounts feature puts time back on your schedule by giving you the ability to edit as many division orders as needed all at once. Fewer clicks, quicker results. Again, with this exciting new feature, you no longer have to go into each individual order to make your adjustments. Adding a team fee for scheduled tournaments and extra training can be done in seconds now. And we even added an auto-confirmation email to streamline the communication as well. So glad you asked! It’s easy. We have created a quick tutorial that explains how to implement, click here. We believe all our partners across all sports can benefit from this new enhancement, and we hope you will take advantage soon. If you have specific questions, feel free to contact our amazing support ninjas at [email protected].